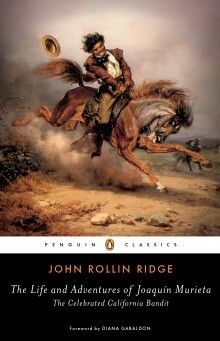 Penguin Classics Publishing has released a new edition of THE LIFE AND ADVENTURES OF JOAQUIN MURIETA: THE CELEBRATED CALIFORNIA BANDIT, by John Rollin Ridge (1827-1867), a novel first published in 1854. This edition features a new Foreword written by Diana Gabaldon, and a new Introduction by Hsuan L. Hsu, a professor of English at the University of California, Davis. This Penguin Classics paperback edition was first released in the U.S.A. on July 10, 2018. Those who have lived in the American West may have heard stories of a Mexican bandit whose head was embalmed and kept in a jar to discourage others from following his example… that’s the character of Murieta. This novel is about life and times of Joaquin Murieta, a Mexican American bandit and folk hero whose family is murdered, and he sets out to seek revenge. It is the first book published in California, the first published book written by a Native American (John Rollin Ridge was a Cherokee), and was also the first book to feature a Mexican main character. Many people today have never heard of this book, even though it has had reverberating effects on fictional characters for over 160 years, right down to the present. Johnston McCully’s THE CURSE OF CAPISTRANO (also known as THE MARK OF ZORRO) is a rewritten version of Ridge’s novel about Murieta; Zorro is a popular heroic character to this day. The comic-book character Batman is said to be inspired, in turn, by Zorro! Even the Lone Ranger has his roots in this book. Diana Gabaldon is a third-generation native of the town of Flagstaff on her mother’s side; her maternal great-grandfather immigrated there from England. She has lived in Arizona most of her life. In her Foreword, written for this edition, Diana discusses what it means to be referred to as a “Mexican.” The Gabaldons have lived in what is now New Mexico since the 1600s, when her original paternal ancestors immigrated from Spain. Diana’s father, Tony, moved to Flagstaff as a child and was a very accomplished and determined man who served for years as an Arizona state senator, and who loved Zorro and Speedy Gonzales (a cartoon character); he also loved to smash racist stereotypes of “Mexicans.” She wonders what her dad would have thought of this 150-year-old novel. Diana discusses the idea of the bandit folk heroes, what they meant to her, her father and her family as she was growing up, and the impacts that these characters and their stories have had on our American literature and history. The first novel to feature a Mexican American hero: an adventure tale about Mexicans rising up against U.S. rule in California, based on the real-life bandit who inspired the creation of Zorro, the Lone Ranger, and Batman. With a new foreword by Diana Gabaldon, the #1 New York Times bestselling author of the Outlander series. An action-packed blend of folk tale, romance, epic, and myth, THE LIFE AND ADVENTURES OF JOAQUIN MURIETA tells the story of the Gold Rush-era Mexican immigrant Joaquín Murieta, whose efforts to find fortune and happiness are thwarted by white settlers who murder his family and drive him off his land. In retaliation, Murieta organizes a band of more than 2,000 outlaws—including the sadistic “Three-Fingered Jack”—who take revenge by murdering, stealing horses, and robbing miners, all with the ultimate goal of reconquering California. The first novel written by a Native American (Rollins was a Cherokee) and the first novel published in California, THE LIFE AND ADVENTURES OF JOAQUIN MURIETA speaks to the ways in which ethical questions of national security and racialized police violence have long been a part of U.S. history. This edition features excerpts from popular rewritings of the novel, including Johnston McCulley’s first novel about Zorro, THE CURSE OF CAPISTRANO (also known as THE MARK OF ZORRO). If you would like a new copy signed by Diana Gabaldon, you may order it from the Poisoned Pen bookstore online or by telephone. Each new copy of this book is $17 (U.S.), and there is no extra charge for Diana’s signature, though you will have to pay for postage. The Pen ships anywhere in the world. To order this book from the Pen, signed by Diana Gabaldon, click here. Or use the buying link on the purchasing menu at left. This book would be a perfect gift for those who love Diana Gabaldon’s fiction and would like to learn more about her, as well as the history of the American West. Click here for more information about buying books written by Diana from the Poisoned Pen. This page was written by Diana’s Webmistress. It was last updated on Tuesday, July 24, 2018 at 8:40 a.m. (Pacific Time).